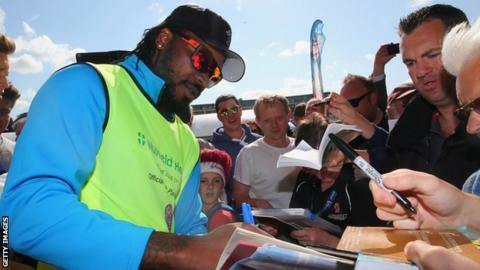 Somerset director of cricket Matt Maynard says West Indies star Chris Gayle is open to a return to the county if they advance in the T20 Blast. Gayle's impact has been immense in the short-form game with the batsman hitting 328 runs in the three games he played for Somerset. "We hope there's a chance of him (Chris) coming back," said Maynard. "Hopefully we will get into that position of either making finals' day or a home quarter final." He added: "It would be brilliant to have him back here. He is very open to the idea." Maynard hailed the contribution of Gayle who has enjoyed an eventful three weeks at the county. The former England Test player said the Jamaican big-hitter's influence had been "immense" and "incredible" after Gayle's final game against Surrey was abandoned without a ball being bowled. "As he got to know the players more, he has chatted a lot more about the game and his philosophy and stuff like that," he said. "It's amazing just how simple his philosophy is, about batting. "It's something you can get caught up on. What do the world's best players do? "Actually, they just keep it simple. I think a lot of other players through time confuse what the game is about and it's just fantastic and very powerful when a player like Chris talks about his game plan and how simple it is. "Even senior players take stock and go, 'Wow'. It really is that simple. He's been immense and on the pitch he has demonstrated how clear his thinking is as well.